The selection at Whole Foods makes me swoon. Walking into a Wegman’s causes heart palpitations. When it comes to cuisine, I love variety and shopping for new, deliciously different ingredients. I’ve been thinking about it and this local thing is going to be hard. Right now in Delaware, there’s really nothing growing fresh. It’s February and the next vegetables aren’t set to pop up until April (see this handy availability chart). Honestly, that’s kind of depressing. Now if I was Super (domestic) Woman I would have canned the bounty from my giant vegetable garden last September in preparation for the winter months. Alas, I’m no such person…at least not yet. So what’s a person to do in the mean time? Am I supposed to ban myself from ever setting foot into a Wegman’s again just to avoid the temptation of buying twenty-eight different kinds of olives? Am I supposed to endure life without…gasp, sob, faint…COFFEE?? (Maybe I’ll just relocate.) The answer to the die hard locavore is yes. If you don’t grow it or buy it within a 100-mile radius of your house, don’t eat it. Frankly, that just seems like self-flagellation, especially to someone that likes to eat avocados and dark chocolate on a regular basis (not at the same time). But I’m just an experimental locavore. I’m trying this out, seeing how it feels. So how do I go local without going overboard? I have my convictions, yes, but how far will I go? This question required some serious contemplating. Given my novice status, I decided that I would try to eat as local as I can, especially during these first winter months. For example, right now I can’t get fresh produce locally. But April through October it will be in abundance (and I won’t eat anything else)! However, I can get local meat and poultry right now. I buy beef and pork and bacon (oh, the bacon!) 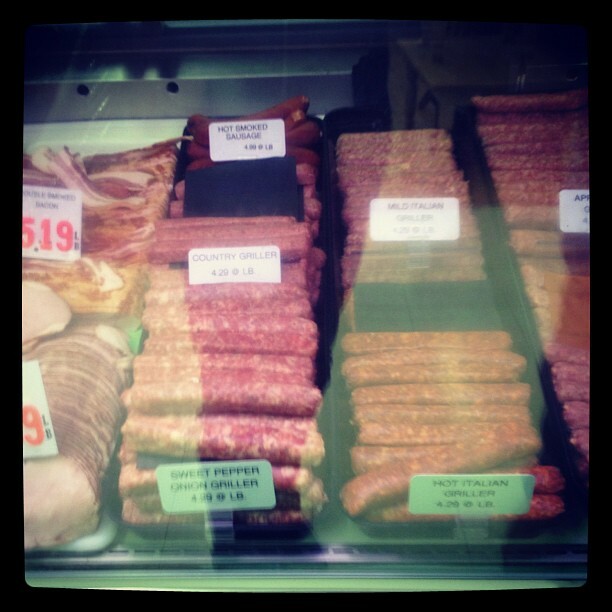 at Fisher’s Meat Market (in the Dutch Country Farmer’s Market in Middletown). The display case at Fisher's. Complete with homemade sausages. I recommend the hot Italian grillers, not too hot. I talked to Mose, the operator of said market, and while a percentage of the meat comes from Lancaster County, PA, a mere 55 miles from my front porch, the farming community there could not support the demand, so he also gets meat from New York and Virginia. That’s good news, seeing as the majority of the nation’s supply comes from the Midwest and Canada. Ground beef and hot Italian pork sliders. Local = Delicious. And they were delicious! Local just tastes better, so what am I really giving up? Grate the onion and the garlic with a cheese grater (or throw them in your food processer). Finely chop the parsley (or include in the food processer). Just make sure that everything is very, very finely chopped. In a bowl, combine the ground beef and sausage. Add the egg and the onion, garlic, parsley mixture. Add salt and pepper to your liking. Using your hands, combine all ingredients until just mixed, but don’t over mix! 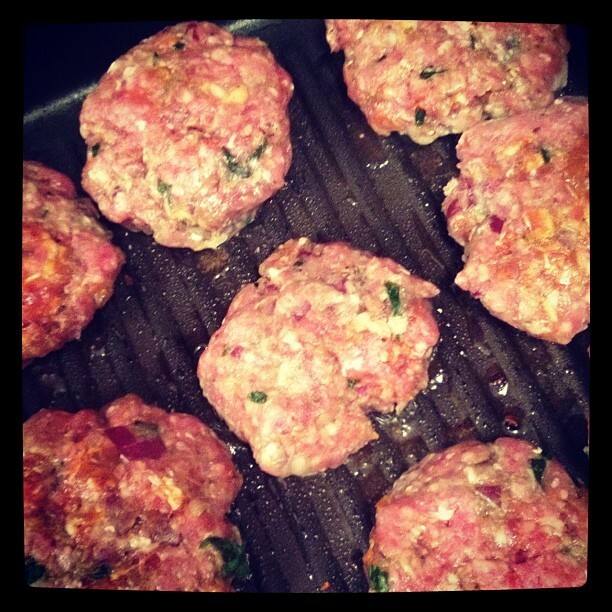 Form into balls and then into small patties. I use the palm of my hand as a reference. (If the meatball fits into the palm of my hand, it’s just the right size for a slider). This recipe made about eight thick sliders for me. Using a preheated grill pan (or an outdoor grill) cook on medium high for about five minutes on each side until cooked through (or to your desired doneness). When there’s about a minute left of cook time, I add the cheese on top. I served mine with ketchup, mayonnaise for the husband, and the romaine I had in the fridge. I think these would be great with cilantro instead of parsley and topped with tomato (in season, of course) and avocado. Great call going local! The more people we chefs get looking for local foods, the easier it will be to find it! Keep up the good work! As an aside, once you’re in the process of looking for local food, it’s often possible to hook up with local farmers directly. I am a member of a farm share and know my farmer well. I’ve spent time at his farm and with his chickens (he has the best eggs). I also love getting to know the vendors at my local farmers market. There’s nothing like knowing exactly where your food comes from! I know I’m getting fresh, organic ingredients.